LAP: So how long have you been the creative director at Queen Mary’s Dark Harbor? JJ: This is my fifth year as the Creative Director for Dark Harbor. LAP: At first, did you have any trepidation about working on the famously haunted Queen Mary? JJ: Oh yes! At the time, I didn’t want to admit how terrified I was on my first tour of the Queen Mary while interviewing for the position in 2011. I was expecting a ghost to pop out at any minute. I hid my fear well though. I mean, who would hire a creative director for a Halloween event on a haunted ship who was afraid of ghosts? Ha! But I loved The Queen Mary and I loved her legends. I was excited to get to know the ship and all of her stories! And since that first season of Dark Harbor, I feel I have developed a nice friendship with the Queen Mary and all of her spooky legends. LAP: We were lucky enough to check out DH last week and loved it. LULLABY was a stand out. Is it safe to assume you based this maze on the real life haunting of the pool area? JJ: Yes, indeed. Scary Mary, our spirit who Lullaby was created for, is our youngest spirit at Dark Harbor. Although our character and her story are fictional, she is inspired by a real legend. Scary Mary is based on a young spirit that is known to haunt The Queen Mary’s first class poolroom. When The Queen Mary was an active cruise liner traveling the Atlantic, it was reported there was a young girl of about 9 years old who tragically drowned in the pool. Since the ship docked in Long Beach in the late 1960s, there have been countless reports of guests hearing a young child giggle. Women who have come through the poolroom have reported the feeling of having their hair pulled. Orbs and child-like forms have appeared in photographs. Guests have claimed the feeling of being gently shoved as if in a game of Tag. Some guests have even reported waking up to a ghostly child figure crying at the foot of their beds. 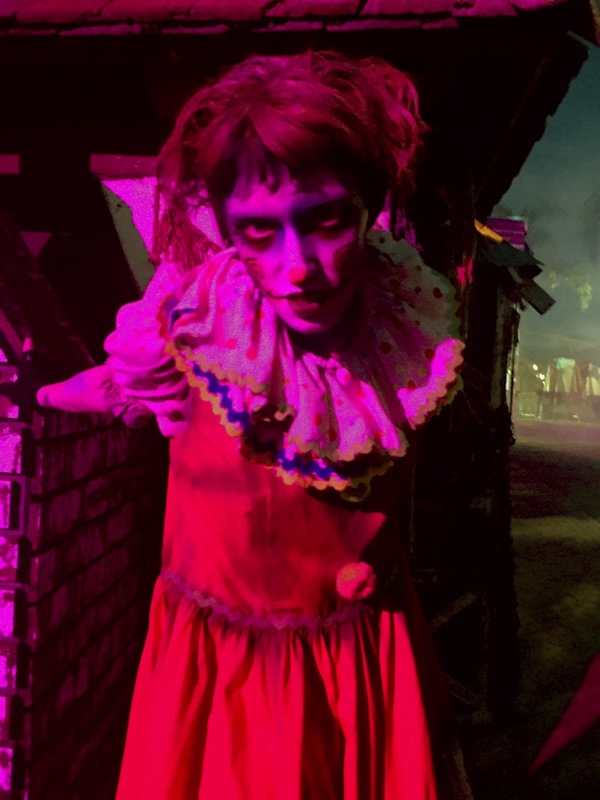 And just this season, during a photo shoot with our Dark Harbor Scary Mary, one of our PR representatives had the sensation of someone pulling on her hand! We don’t know the details of the life of this spirit, but it is from these encounters we were inspired to bring to life, Scary Mary. LAP: When you visit Dark Harbor, you quickly realize a lot of the maze themes are unique to the Queen Mary’s maritime and paranormal history. Can you give us a little insight into the real life inspiration for any of the other mazes and characters of Dark Harbor? THE CAPTAIN – Captain of all Dark Harbor and all spirits. The Captain is the spirit of the most feared captain to serve aboard The Grey Ghost during WWII. He is a fierce warrior and fearless leader. He is the captain of Dark Harbor and all of the spirits who haunt it. During his mortal life, he was dedicated to The Queen Mary. He would stop at nothing to protect his troops aboard The Grey Ghost. Now in his life after death, he is a strong spirit who will protect the ship and all of the rightful spirits aboard the ship and in the harbor at ANY cost; even if it means collecting more souls to serve in his army of spirits. Beware his rage and fierce strength and warlike strategies . . . he may just choose you to serve along side his vicious spirits. Gale, like a gust of wind, floats through Dark Harbor sweeping through the souls of the mortal. In the late1930s, Gale was the belle of The Queen Mary. She was a beautiful first class passenger known for her charm and her graceful way around the dance floor. Men lined up to dance with her, women envied her beauty and elegance. In 1939Gale made her final passage across the Atlantic aboard The Queen Mary. No one knows what mysteries surround her disappearance. She was welcomed aboard the ship in May of 1939, however when the ship reached her destination, Gale had vanished. To this day there is no evidence or clues to solve the disappearance of the lovely lady. However her spirit has remained aboard this vessel. She can be seen gliding gracefully around the ship. If you are lucky enough to see her, she may extend her hand for a dance. But dance with caution, for her charm has been known to captivate and capture many souls of the mortals . . . and her darkest secret lives on. In death, she tears apart the living and reassembles her victims to create the perfect dance partner. Maybe you will be her next victim as you make your way through her tortured maze. (*Bringing to life the actual encounters surrounding the daring crew fire firefighter who haunts the engine room). Half Hatch Henry is the spirit of a young adventurous firefighter who died aboard the ship in 1966. On a dare with his buddies Henry dangerously bounded over the threshold of one of the watertight hatch doors. Henry only made it back and forth between the threshold six times and on the seventh daring leap, hatch door #13 slammed close crushing Henry. The young, handsome and adventurous Henry can be seen throughout Dark Harbor, but be warned, Henry is tricky and just when you think you know what to expect, the spirit of this dare devil will show up to turn things inside out. (*Bringing to life actual encounters and stories surrounding the death of a 3rd Class Passenger who violently haunts room B340). On a 1948 Atlantic voyage, third class passenger, Samuel, was locked away in room B340 after a violent outburst. The enraged Samuel went on a spree of violence, brutally killing several other passengers. While locked away in B340, Samuel tore apart the room in anger. When crew finally opened the door to B340, Samuel was found violently ripped apart and dead. It is unknown if Samuel was brutally murdered while contained in his room, or if he is responsible for his own violent demise. In death, Samuel is even more cruel and dangerous. At Dark Harbor, Samuel is fighting his tortured soul and WILL come after you if you cross his path . . . No one is safe. SCARY MARY – Splashing spirit of the brand new maze LULLABY. (*Bringing to life actual encounters and stories surrounding the death of the youngest spirit in the first class poolroom; who drowned while traveling on the ship). Scary Mary, Dark Harbor’s youngest soul, has haunted the ship ever since her horrible drowning in the poolroom in 1952. Before her death she was a sweet and playful child, or so they thought. She was actuallya bad seed. She stopped at nothing to get her way, even murder. Her father knew there was no stopping her. He knew he could only do one thing. So he took her in to the pool and drowned her. In the spirit world Scary Mary is even more evil and in search of a playmate . . . a living soul that can join her for eternity. She can be spotted through out Dark Harbor, but the poolroom of Lullaby is her playroom. She has been known to playfully pull hair, to skip and laugh around the pool, and to play a vicious game of tag. Be warned, if you experience an encounter with the playful spirit, she may have just chosen you to join her in the vortex of life and death. Proceed with caution; this may be your last journey through Dark Harbor as a mortal soul. LAP: I’ve heard rumors of DH scare actors being touched and hearing voices while working in the mazes. Can you confirm this and has anyone ever quit because of a paranormal experience? JJ: I don’t recall anyone having quit due to a paranormal experience. But I know several stories of actors having experiences aboard the ship while performing. My absolute favorite one that chills me to this day is from two years ago. An actor working just outside the poolroom felt a cold breath down his back. He pulled out his phone, took a selfie and there was a man’s face peering at him over his shoulder. As if some one was right behind him. But there was nothing behind him. Nothing but a blank wall. LAP: Have you experienced anything paranormal? If so, do you have a “favorite” or most memorable encounter? JJ: Working in some of the darkest areas of the ship, our creative crew and even some of our monster actors have reported some of their own encounters. One of the most chilling stories I have heard is one that happened during last year’s event. Just after opening, two of our technicians were sent in to one of the mazes for an inspection. They were to fix any props that may have been damaged the night before. When they got to the poolroom, one of them cried out in pain. No one was around him, there was no explanation as to where the pain came from, but he felt as though something large had scratched him across the back. He quickly left the poolroom. Once outside, he had his co-worker take a look at his back. Three scratch marks were streaking down his back. By the time he got home, the scratches were gone, leaving no trace that they had ever been there. A week later, I was in the poolroom with one of the ship’s managers. Unaware of the incident with our technician, he cried out in pain just as the technician did. This time the pain was coming from his leg. He lifted his pant leg and three scratch marks were streaking down his leg. The next day he came in and the scratches were gone. Another friendlier story is actually from my first year on the team. My business partner Adam and one of our leads, Stephen, were dressing in one of the mazes on the ship. It was fairly lateand in an area guests are not allowed after the tours close. They were stacking old trunks and they had just finished a stack and secured them with zip ties and screws and straps. They stepped out to get another trunk. They were gone less than 90 seconds. When they returned their secured sculpture of trunks was scattered through out the maze. No signs of broken zip ties or torn straps. No signs of other staff member or any other person for that matter. These friends, like myself, were skeptical coming in. They spent the first half of that first year explaining away small unexplainable occurrences. Until this night; on this night, they both just couldn’t explain this one away. On this night, we all became believers. LAP: Is there any place on the ship you won’t go to alone? JJ: Absolutely. There are two places. The changing rooms in the Poolroom and The Boiler Room. I will briskly walk through the poolroom alone, but there is no way you will find me in the changing rooms without a buddy. The changing rooms are thought to be, by paranormal experts, the ships “vortex.” This means, that it is believed, that this is the area on the ship that the spirits aboard the Queen Mary pass from their paranormal world into our world. The other place on the ship is the boiler room. Below sea level, it is the vast open space underneath the B340 Bridge. The environment alone will send chills down your spine. But this space is also thought to be one of the only areas aboard the ship that has seen significant poltergeist activity. The hair stands up on my neck every time I go in there . . . even with a friend. 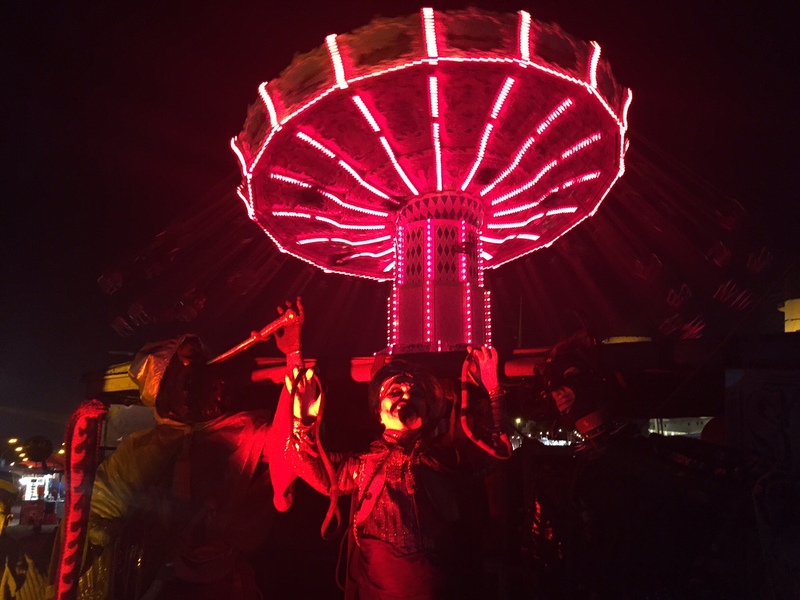 LAP: Tell us, what’s the story behind the awesome swing ride featured at Dark Harbor? Is it true that it originally came from Michael Jackson’s Neverland Ranch? JJ: Yes, that is true. One of the things I love most about Dark Harbor is the energy and the excitement outside of the mazes. Shows on multiple stages (including contortionist, magicians and fire-breathers), Slider Olympics, DJs, cocktails, and hookah . . . It just doesn’t seem complete without some kind of creepy carnival ride! We wanted something vintage looking, we wanted something fun, and wanted something that captured the spirit of Dark Harbor. We searched high and low, and we were delighted to get this ride from the man who brought us Thriller! LAP: Thanks so much for your time, Is there anything you want to let people know about the 2015 Dark Harbor we haven’t covered? 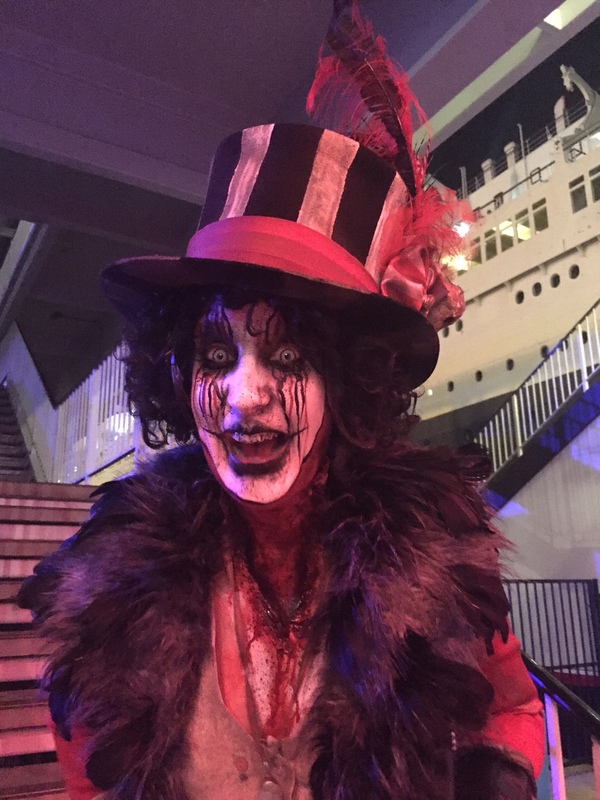 JJ: Thank you so much for allowing us to share with you a bit about Dark Harbor and the spirits of The Queen Mary. We are so glad you got to join us last week! Please don’t hesitate to let us know if you have any further questions! ~~ QUEEN MARY’S DARK HARBOR runs select dates through Nov 1st. Be sure to check out this truly haunted attraction. Next Next post: The Wiltern is Having a Halloween Party / Haunted Movie Marathon – and We Are Giving Away Tickets!